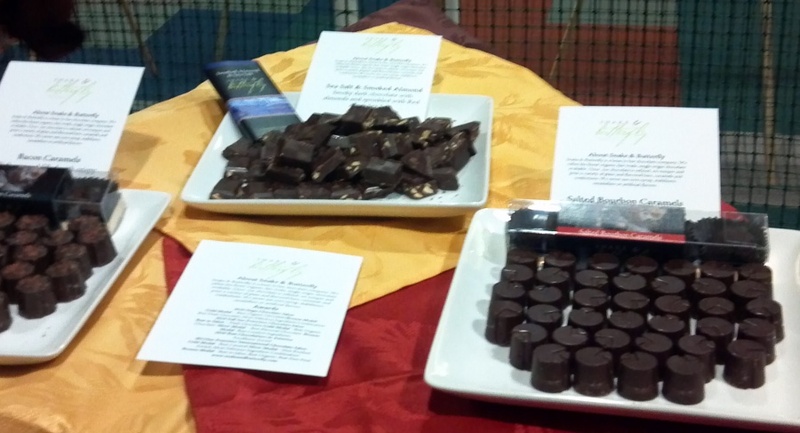 Last weekend I went to the Northwest Chocolate Festival. I figured I'd have some chocolate and maybe even get some entertainment. Instead I was stunned. In a good way. With table after table of high quality ("fine") dark chocolate, it's hard -- nay, for some of us, impossible -- to pass up the opportunity to educate our tongues. Educate I did. Until I was nearly sick. Yes, it is possible to consume too much superb chocolate. You just have to work hard at it. I also learned a tremendous amount about chocolate. 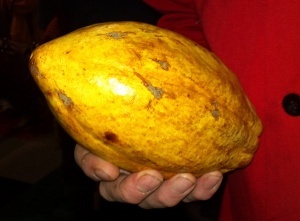 I had no idea it was so complicated to make or that the difference between the wealth of the cacao farmers and us consumers was so great that most farmers never even taste the chocolate that results from their work because they can't afford it. I also understand that making us consumers feel bad for eating chocolate does the farmers no good at all. The key is to gently educate us about what it takes to make really good chocolate, get our tongues involved, and then -- as happened with coffee -- we will gladly pay for the quality we will come to demand. Everyone benefits. Even the farmers. A little simplistic? Sure. But Big Chocolate (Hershey, Nestle, etc.) are not interested in creating educated consumers. They know how to fill out their few percentages of actual chocolate with sugar and emulsifiers and artificial ingredients to make it taste sort of like chocolate to the uneducated. It's cheaper that way. Never mind the farmers. It's business. And that's pretty simple. Unpleasant, but simple. That's the corporate entity for you. While I'm at it, don't bother to choose your chocolate based on the "fair trade" certifications. Farmers get maybe a percent at best for your buck-fifty extra. It's the certification company that's raking in the bucks. I know: I wanted it to be that simple, too. It will get simpler, but for now it's just messy. I predict chocolate will change in the upcoming years and for the better. Remember when you used to drink instant coffee every morning and now you drink fresh-brewed lattes? Keep watching chocolate. Keep educating your tongue. And if you didn't go to the festival this year, don't miss next year's. It was seriously fun and decadently wonderful. And oh-so educational.